The Lutheran Women’s Missionary League faithfully supports the work of The Lutheran Church—Missouri Synod through Mission Grants, which are funded in part through contributions collected in the familiar mite boxes. The following reports highlight the work made possible by these grants. 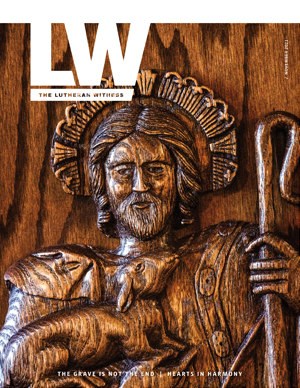 Since the LWML graciously awarded our grant, the Lutheran Young Adult Corps (formerly known as the Lutheran Youth Corps) continues to develop and grow. In our first year, Lutheran Young Adult Corps had five young adults serve in the summer of 2017, and 12 participants served in Gap Year 2017–18. We are grateful that our grant from the LWML allowed us to keep the cost low for participants as well as the 13 community partners they served. Participants who served with us have gone on to several Concordia universities. One alumni participant was hired as a staff member where they served, and another is pursuing long-term international service through the LCMS. In our current year, 13 young adults served in summer 2018, and five are serving in Gap Year 2018-19. Participants serve with LCMS congregations, campus ministries and Recognized Service Organizations to add capacity for these partners to share the Gospel. In this cycle, we continue to serve in St. Louis, New Orleans and Boston. We have added additional community partners, and Detroit was added during the summer. For the next cycle, we are looking to move locations from Boston to Milwaukee. Applications are being accepted for the 2019–20 program year. Program Manager Julianna Shults is working hard to recruit for both our summer and Gap Year cycles. The application period closes on March 1, 2019. 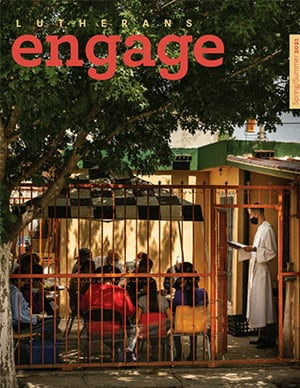 We worked with LCMS Servant Events and the Office of International Mission to create a Reporter supplement and other publicity highlighting the many service opportunities offered by the LCMS. We continue to connect with students and church leaders at conferences and via Facebook, Instagram and Twitter. We are grateful for the LWML’s support of our program. The LWML provided a $100,000 grant to LCMS Disaster Response for portable communion kits and a building to serve as a disaster-response center in Latin America. It is common in the United States for LCMS pastors to have portable communion kits, but it’s rare in Latin America. A conference in April 2016 was offered to seminarians and leadership from partner churches in Latin America. Instruction focused on a theological approach to pastoral care after tragedy and disaster. Upon completion of the conference, participants received communion kits to be used during disasters. LWML mites purchased 137 high-quality, portable communion kits. These kits are allowing local pastors to take this wonderful Sacrament to those who are in the hospital or homebound. Some of the sets have even made their way to the altars of Latin American churches that did not have one before. We would consider that unthinkable, but the impact cannot be overstated. A disaster-response center is being developed to provide emergency housing for those in the Dominican Republic and the entire Latin America region. The Dominican Republic is the hub for LCMS mission work in the region. On average, the area sustains a major hurricane every four and a half years. It is also regularly affected by some of the world’s largest and most deadly earthquakes. The disaster-response center will also serve as a training center for future pastors and deaconesses from partner churches, as well as provide a place for continuing education for our missionaries scattered throughout the region. The beneficiaries of such a center are not just Lutherans, but also those who do not know Christ. It provides a great opportunity to bear a clear and merciful witness to our Lord and His love for us. The facility will be useful for years to come. A survey of neighboring land to ensure property permission is in place for the upcoming construction. Major construction on the center is estimated to begin before the end of the year. The LWML provided an $80,000 grant to LCMS Disaster Response to assist with the purchase of 20 new disaster-response trailers. These funds were used in a collaborative partnership between LCMS Disaster Response and each recipient LCMS congregation and district. Each participating organization provided one-third of the funding toward the purchase of a trailer stocked with disaster-response equipment and supplies. Originally, the plan was to provide 20 grants. But after negotiating a group-purchasing agreement and doing additional fundraising, LCMS Disaster Response was able to give out 26 grants. The $80,000 received from the LWML has been multiplied into nearly $280,000. At the time of this report, the trailers were being outfitted and the tools shipped to the grant recipients. These groups have agreed to maintain and use the equipment for mercy work throughout the year and for disaster response when the need arises. Many of the organizations have already received their training or will receive it in the near future. By providing disaster-response trailers, the capacity of our districts and their congregations to respond in times of disaster has been greatly multiplied. The trailers allow groups to quickly provide volunteers for debris cleanup after hurricanes, floods, tornadoes and other disasters. In this way, they are able to reach out with Christ’s mercy and bring relief and comfort. Mercy is a hallmark of the Church. Throughout history, Christians have been known by the world as generous people, whose good works are motivated by their faith in God. Disasters, while terrible, are a time when the Church can truly care for the greatest treasures of this world — people. Those who benefit most are individuals who would struggle most after a terrible natural disaster, especially the elderly and single-parent families. As they are assisted, they are directed to the altars, pulpits and fonts of local congregations, where they can receive the forgiveness of sins and care for the soul, even while they receive care for the body. 26 trailers have been or are being purchased to be deployed in 21 districts. More than 14,000 individuals have been trained as Lutheran Early Response Team volunteers. The LWML provided a $100,000 grant for the LCMS Global Seminary Initiative (GSI) to provide scholarships for pastors from emerging and partner church bodies so that they can obtain advanced degrees at the two LCMS seminaries. GSI also sends LCMS professors and qualified pastors to teach at regional seminaries around the world and provides scholarships for students attending in-country seminaries and educational conferences. With this grant, GSI received a two-fold blessing as these funds were matched, dollar for dollar, by a separate challenge grant, making a total of $200,000 available for scholarships. Improving Lutheran theological education worldwide is at the heart of the Global Seminary Initiative. The most frequent request by LCMS partner churches is for help with theological education. The LCMS is sought out for its high academic standards, its theological position that the Scriptures are the inspired and inerrant Word of God, and its commitment to upholding the Lutheran Confessions. The growth of Lutheranism worldwide as the most faithful confession of the Christian faith depends on well-trained pastors and church leaders. The Global Seminary Initiative is an opportunity for the LCMS to affect the world. Bringing the best students from around the world to our LCMS seminaries to study at the graduate level so that they can return to their home countries and provide advanced theological leadership. Supporting local regional seminaries — both through infrastructure improvements and scholarships. Providing continuing education through seminars, conferences and visits by qualified LCMS pastors and professors to teach in the local context. One of the scholarship recipients is a student from Madagascar who is attending classes in the United States in preparation for returning to his country as a Lutheran pastor. The Lutheran church in Madagascar has about 4.5 million members and is opening at least one new congregation each week. One of the biggest challenges to expanding the church and proclaiming the Gospel in Madagascar is a lack of pastors and a lack of people to train pastors. Thanks to his education in the United States, he will be a prime candidate to help train future pastors in Madagascar. Since receiving a mission grant from the LWML this past year, the LCMS National Housing Support Corporation (NHSC) has been able to expand its Helping Hand Initiative with new congregational partners in new communities. In the Landsdowne Neighborhood of East St. Louis, Ill., Pastor Willie Stallworth and the people of Unity Lutheran Church spearheaded the Helping Hand Initiative by assisting 10 homeowners. A team from Laborers For Christ assisted with the repairs. A team of volunteers from Trinity Lutheran Church in Fremont, Neb., worked with Rebuilding Together Platte Valley East to complete critical repairs at the homes of two homeowners near the congregation’s early childhood center. Through the Helping Hand Initiative, local LCMS congregations reach out to their neighbors and assist with specific home repairs for low-income or elderly residents, connecting with residents who need repairs and rallying volunteers for the repair effort. The partner congregations serve not only as the face of the repair effort, but they also provide financial mentoring and spiritual support to all of the individuals involved in the project. NHSC provides logistical guidance, project development assistance, project templates and assistance with identifying resources for the initiative. While the initiative provides opportunities for Gospel witness, Unity, Trinity and their members undertake the work of mercy because they wish to strengthen their communities and assist their neighbors in need, always standing ready to give a reason for the hope that lives within them (1 Peter 3:15). For more information about the work in East St. Louis and Fremont, visit nationalhousingsupport.org/helpinghand. Check us out on Facebook at facebook.com/LutheranHousingSupport. The LWML provided a grant of $25,000 to LCMS Black Ministry to help lay the groundwork for the Rosa J. Young Academies project. Rosa J. Young was born in 1890 to ordinary African-American parents. However, she did not let her race define her. She let her Christian faith define who she was, and so her Lutheran faith is the center of her legacy. Young decided to open her own school for black children in the rural South in 1912. Over the next several years, she was instrumental in the development of 30 Lutheran elementary schools and 35 Lutheran congregations in Alabama. To Young, education was important, but a Christian education was better. She was 22 when she decided to open what would be her first elementary school. She taught more than 2,000 students, impacting their lives forever with her faith. In 1961, she was awarded an honorary doctorate by Concordia Theological Seminary. She was both the first woman and the first African-American to be honored in this way by The Lutheran Church—Missouri Synod. Her love for Christ, our Savior, and the confessional teachings of the LCMS created a lasting legacy. Many of Young’s students went on to serve nobly in secular professions. Many more became pastors and teachers. Her story is timeless and useful. It offers hope in adversity for rural and inter-city mission work today. A century later, her legacy has become the inspiration for educating a new generation. The Rosa J. Young Academies and After-School Programs have the goal of re-establishing Lutheran Christian education in districts where there are large black and immigrant populations. Meet with community stakeholders in Alabama regarding the project.